Augustina Droze’s painting “Kingfishers in Mound” is on view in Indigo Art through Aug. 8. A morbid beauty suffuses "Prodigal Collections," an exhibition of new paintings by Buffalo artist Augustina Droze that depict dead animals arranged in symmetrical patterns. 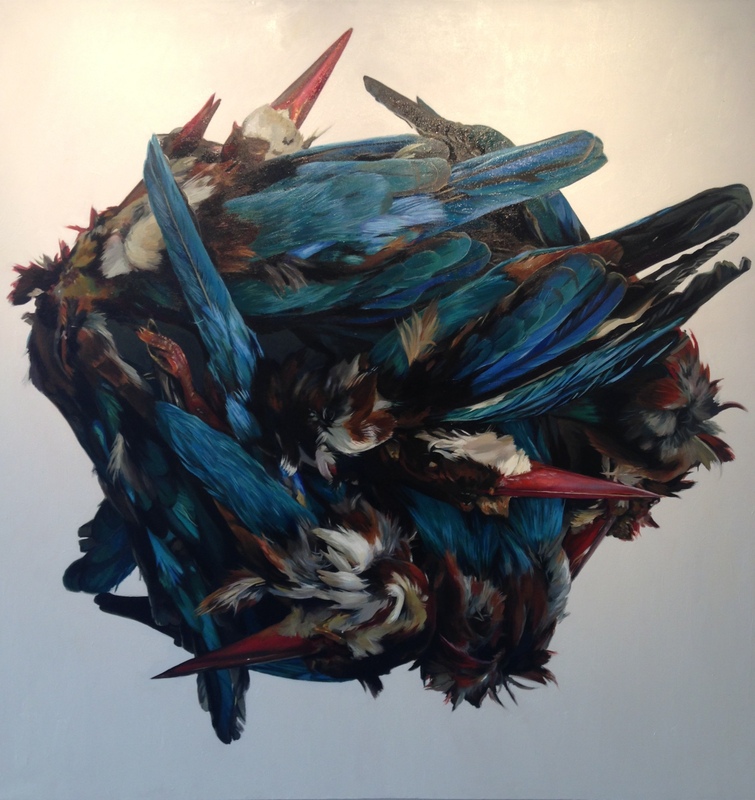 For the viewer, that morbid beauty morphs easily into morbid curiosity, as in Droze's painting "Kingfishers in Mound," which she painted using actual deceased birds as references. In the piece, like her other paintings on view in Indigo's new space at 47 Allen St., the creatures are arrayed in a formation based on Eastern mandala paintings. Her intent with the series, Droze said, is to create "a reflection of our societal manipulation of nature and our fascination with death." The paintings, each one entrancing in its way and rendered in sumptuous colors, are paired with actual specimens of dead animals enclosed in glass domes. The presence of those specimens heightens the art's off-putting effect, pointing viewers' thoughts in darker directions than the paintings might do on their own. The result, in this particularly well-executed painting, is a reflection on the ways humans bend nature to their whims in ways that might be considered grotesque. "The piece," as Droze said, "is beautiful and morbid at the same time." Augustina Droze's painting "Kingfishers in Mound" is on view in Indigo Art through Aug. 8.